Women Making Peace(WMP) - Who are we? We promote tolerance and peace of mind as general values in society, promote citizens' peace-making skills, and in general cultivate a life-centered culture of peace for the world. 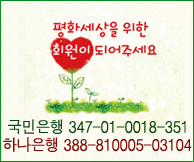 We carry out concrete social actions to facilitate Korean reunification and peace. We try to facilitate the equal participation of women in the settlement of conflicts and disputes and to promote women's leadership in peace-making at home and abroad. We work in solidarity with international peace groups, exchanging information concerning peace and security and thus expanding international women's peace-making networks.